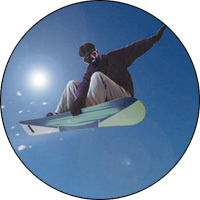 The Mu2 SportsMask is the only permanent air filter designed for use in active sports. Its unique filter membrane blocks all dirt, dust, and pollen, is easy to clean, and provides you with an unrestricted supply of clean air. Conventional filter masks have many drawbacks. Worst of all, they restrict your airflow, which decreases your ability to perform. They're also uncomfortable, good for only one or two wearings, and look a bit, well..."dorky". Mu2 eliminates every one of these drawbacks with a stylish, comfortable, full-flow mask that was designed specifically for athletes. If you ever exercise in dusty conditions or are sensitive to pollen, you need this product. Conventional filter masks work by trapping contaminants within a matrix of coarse woven fibers. (The magnified view on the left of the image below show what a conventional filter masks looks like up close.) The problem with this type of filter is that it also restricts the flow of air. And as more and more contaminants get trapped within the fibers, the filter clogs and the restriction increases. Unlike conventional filter masks, Mu2 uses a medical-grade synthetic micro-monofilament material with precision micropore openings (shown below on the right). This material, called "MicroAirScreen", does not degrade, support bacteria growth, or entwine pollen like natural fibers do. The pores of the MicroAirScreen are small enough to prevent passage of the smallest allergenic pollen (about 18 microns in diameter), but are numerous enough to provide unrestricted airflow. You'll never have to replace the Mu2's filter, because it doesn't get clogged, and is easily cleaned with normal soap and water! The Mu2's MicroAirScreen filter is permanently bonded to its polyester-faced neoprene body, which includes an adjustable Velcro neck strap and an anodized aluminum noseclip. This construction provides rugged durability while insuring a comfortable, customized fit. The Mu2 SportsMask won't restrict your breathing, and can be used for any sport (e.g. 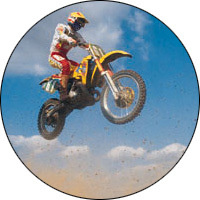 running, cycling, motocross, skiing), construction work (e.g. demolition, drywall, sand blasting, landscaping), or hobby (hunting, woodworking, gardening). 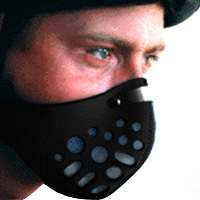 It's the best way to protect your lungs and sinuses from all types of airborne dust and pollen. 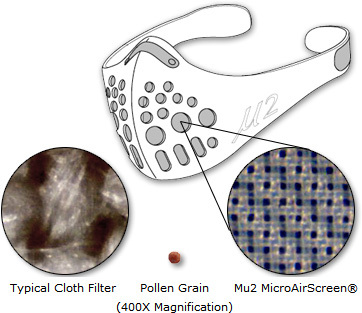 Note: The Mu2 SportsMask effectively blocks all dust, pollen, and similar particulate matter. However, it's not designed to block chemical fumes. 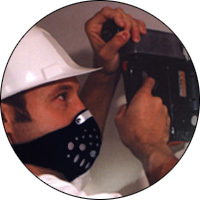 For work around paint, solvents, or other chemicals, please use a chemical respirator. Mu2's large SportsMask is the best fit for most men. The slightly smaller medium is the best fit for most women and older children. Includes zippered nylon storage pouch.